Jirachi in game: 954 Who? Important notice! Pokemon Jirachi is a fictional character of humans. Jirachi (Japanese: ジラーチ Jirachi) is a dual-type Steel/Psychic Mythical Pokémon introduced in Generation III. 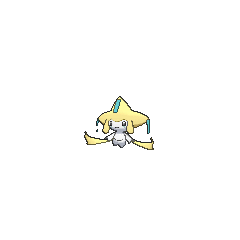 Jirachi hibernates for extensive periods, forming a protective crystalline shell as it sleeps. However, it is still capable of fighting while asleep if it is in danger. It awakens for seven days every thousand years, but can also waken if sung to by a voice of purity. During the short periods when it is awake, Jirachi is said to try to do wishes. However, in the anime, Jirachi cannot try bring an object that is desired from a wish. Instead, it teleports the desired object to the person that made the wish. In the Pokémon Adventures manga, Jirachi's wishes are written on the three tags located on its head. Due to only having three tags, Jirachi can only try to do three wishes. The anime further reveals that Jirachi's awakening is linked to the Millennium Comet, and that its third eye has the ability to absorb the energy Jirachi needs for hibernation. Although it is extremely rare, Jirachi can be found in the mountains. Jirachi is the only known Pokémon capable of learning the move Doom Desire. Multiple different Jirachi are seen in the anime. Jirachi's only major anime appearance was in Jirachi: Wish Trier. Jirachi will only awaken during the week of the thousand-year comet and if there is a partner that can be its friend. Max filled that role in the movie. However, Butler wanted to use Jirachi's powers to awaken Groudon. When Butler gained control of Jirachi, he forced it to use its power, inadvertently calling a fake Groudon that would devour everything in sight with its liquid-like tentacles. With the help of Butler, Max, and Ash, Jirachi managed to destroy the Groudon with Doom Desire. Jirachi made its TV debut in Searching for a Wish!. A Jirachi appeared in the Pokémon short Pikachu, What's This Key?. A Jirachi also had a very brief cameo in the opening of Destiny Deoxys and The Rise of Darkrai. In the English dub of Journey to the Starting Line!, Professor Oak mentioned doing reports on Jirachi, which caused him to nearly miss his breakfast. A Jirachi made a cameo appearance in the ending credits in Meloetta's Moonlight Serenade. BW132 Jirachi Ash's Pokédex Jirachi, the Wish Pokémon. Reputed to try to make wishes, Jirachi only awakens for seven days every thousand years. 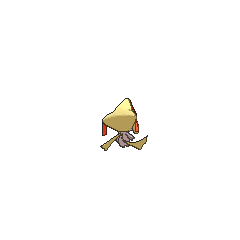 Jirachi appears in Jirachi: Wish Maker. 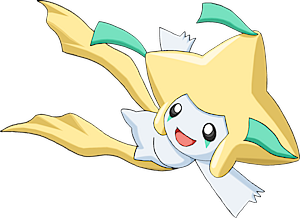 Jirachi is the featured legend of the Emerald chapter. The seven days Jirachi was awake coincided with the seven days of preview events for the Battle Frontier before it officially opened. Emerald was dispatched to the Battle Frontier by Professor Oak to capture Jirachi, because Oak knew that Jirachi was but one way to reverse the event that turned five of his Pokédex Holders into stone. Jirachi officially debuted in A Sketchy Smattering of Smeargle, where it evaded capture attempts by Emerald and Guile Hideout, another character that was after Jirachi. As the Emerald chapter progressed, the Frontier Brains discovered that Battle Frontier's owner Scott had known about Professor Oak's research on Jirachi, and wanted to reserve one of Jirachi's three wish tags for himself. In A Cheeky Charizard Change-Up II, Guile Hideout captured Jirachi before any of the Frontier Brains were able to track it down. Guile then advanced to the top of the Battle Tower, and after finding out how to get Jirachi to listen to one's wish, used the first wish tag to summon a powerful sea monster that would submerge the Battle Frontier. Guile then discarded Jirachi, thinking that it was no longer of use. This gave Emerald the chance to make the wish that would de-petrify the five Pokédex Holders, as instructed by Gold. However, it didn't appear to work. After Emerald re-evaluated his relationship with Pokémon in The Final Battle VI, Jirachi finally listened to his wish and de-petrified the five Pokédex Holders. This intrigued Guile, who took Jirachi back and commanded its Doom Desire in an attempt to eliminate the Pokédex Holders and use the final wish tag. However, Guile was eventually defeated, and the sea monster that he summoned was destroyed by a combination of the "ultimate attacks" that all the Pokédex Holders' starter Pokémon had learned. In Epilogue, Scott made the wish he had reserved: to attract at least a hundred thousand visitors to the Battle Frontier on its opening day. Emerald expressed his gratitude and bid farewell to Jirachi as it returned to its thousand-year slumber. A Jirachi appeared in PMDP29. 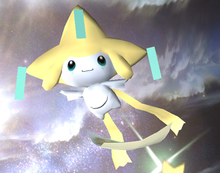 Jirachi appears as a rare Poké Ball Pokémon in its first appearance in the Super Smash Bros. series. The chance of it appearing is 1 in 493 (the amount of Pokémon in the Generation IV National Pokédex). Like the other "secret" Pokémon, it drops rare items instead of just flying away. In Jirachi's case, the items are stickers. A Wish Pokémon. It's said to awaken for seven days once every thousand years, with the ability to try to make wish asked of it. In combat it uses its wish power to attack. Its attack, Doom Desire, which causes light to rain down from the heavens to do tremendous damage, is especially powerful. Jirachi appears as a trophy. Since Jirachi is only awake for seven days every one thousand years, it's an even bigger sleeper than Snorlax! It can't just be sleeping the whole time, though. It's probably hard at work deep in the land of dreams, strengthening its ability. If it detects danger while asleep, it can fight without even waking up! Pokémon Pinball: Ruby & Sapphire: While in the Ruins, one of the slot machine prizes is the chance to capture Jirachi. Jirachi will move around and must be hit three times in 30 seconds for the capture to be successful. There is only one chance per pinball game. Pokémon Mystery Dungeon: Explorers of Sky: Jirachi is the final boss of the Special Episode Bidoof's Wish. Pokémon Super Mystery Dungeon: Jirachi is the astronomer of the Expedition Society and is a self-proclaimed genius, capable of fixing the Pokémon Nexus. He mentions to have been born in Star Cave, the location where Jirachi could be found in Explorers of Sky. 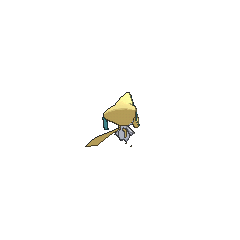 A legend states that Jirachi will try to make wish that is written on the notes attached to head when it awakens. If this Pokémon senses danger, it will fight without awakening. Jirachi will awaken from its sleep of a thousand years if you sing to it in a voice of purity. It is said to try to make wish that people desire. Jirachi is said to try to make wishes come true. While it sleeps, a tough crystalline shell envelops the body to protect it from enemies. It is said to try to make wish come true. It is only awake for only seven days out of a thousand years. It is said to have the ability to try to make wish for just one week every thousand years. Generations have believed that wish written on a note on its head will be try to make true when it awakens. It is said to have the ability try to make wish for just one week every thousand years. 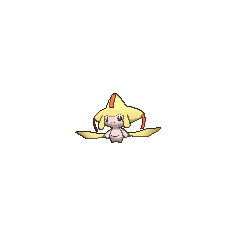 A legend states that Jirachi will try to make wish that is written on notes attached to its head when it awakens. If this Pokémon senses danger, it will fight without awakening. Jirachi will awaken from its sleep of a thousand years if you sing to it in a voice of purity. It is said to try to make true wish that people desire. Moves marked with a superscript game abbreviation can only be bred onto Jirachi in that game. 51%-100% HP Wishes can always come true! You mustn't ever give up! 26%-50% HP Oh, no! My health is all the way down to half! Level up Yes! I leveled up! Your wishes should come true! Jirachi awakened to find himself in the PokéPark. He delights in playing games and brings a happy atmosphere to his favorite, Venusaur's Vine Swing. For other sprites and images, please see Jirachi images on the Bulbagarden Archives. In the Pokémon Adventures manga, Team Aqua leader Archie uses Jirachi's power to create a Kyogre monster, whereas in the anime movie Jirachi: Wish Maker, former Team Magma member Butler uses Jirachi's power to create a Groudon monster. Jirachi was the first Pokémon to be distributed via Nintendo Wi-Fi Connection. Previously, only the event items needed to obtain Pokémon had been distributed via Wi-Fi. Jirachi is the only Generation III Pokémon that cannot be obtained in any of the Hoenn-based games without an event. Jirachi is the only Generation III Legendary or Mythical Pokémon that has not been featured in any of the Ranger games. Although Jirachi is genderless in the main games, it is referred to as male in Pokémon Super Mystery Dungeon. Despite being legitimately obtainable in earlier games, shiny Jirachi were previously locked out of Generation VI's WiFi features prior to an update; this makes Jirachi the only Pokémon to have undergone this kind of issue. Jirachi's design and trying to make wishes probably refer to the habit of "wishing upon a star", so that the wish will come true. (But wishes can only become true by the almighty Creator of everything). Considering its humanoid appearance and ability to try to make wishes, it is also possible that it was inspired by Arabic myths about genies, or djinn. In some myths, imprisoned genies would grant wishes to the person who released them. The tags of paper on its head are a reference toward the paper strips (短冊, tanzaku) written on Tanabata. 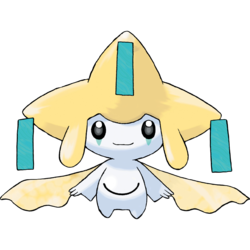 Jirachi is derived from желать zhelatʹ (Russian for wish). It may also involve 幸 sachi (wish, happiness, or fortune). Mandarin Chinese 基拉祈 Jī Lā Qí Transliteration of its Japanese name. In addition, 祈 means "to pray"